A college degree is required of nearly all our employees. We want people who specialize in the skills they learned in their marketing, sales or design program. 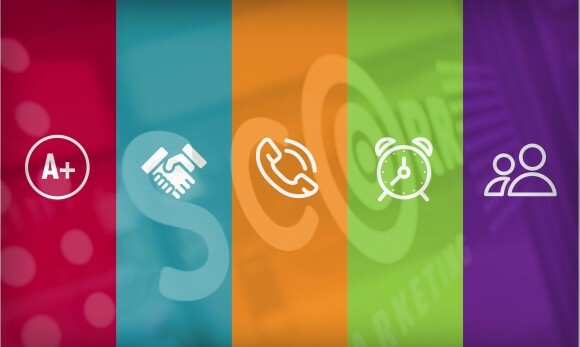 But there are certain skills and lessons that you won’t truly know until you’ve worked at SCORR. That isn’t to say you can’t pick these up anywhere else. But here are five of the many things SCORR employees can agree you’ll learn, as they have, while working here. There’s no doubt, it would in college. But there are no shortcuts when it affects people and businesses. Clients trust and invest in us with every project we do, and for that, we give our best effort possible. We’re not talking LinkedIn. On both an internal and external level, you’ll have the opportunity to build real, professional relationships with people from a multitude of industries — ones that can help you throughout your career. Your generation may not be used to this. But trust us, by making that call, you’ll save yourself a boatload of time that you could’ve spent typing that email. People in our business admire and respect verbal communication. Here’s your chance to use it. In college, if you turned in a paper late, no one’s business suffered. That isn’t the case in the deadline-centric world of marketing. Here, you’ll learn how to prioritize projects, create to-do lists and block out time as needed. Your Outlook calendar will become your best friend. You’ll come to find that at SCORR, there are no co-workers, just teammates. Through highs, lows, successes and failures, we experience it all together. By trusting each other, our clients trust us, and we all accomplish more because of it. A career in marketing isn’t for everyone. But a career at SCORR can be a fun, rewarding opportunity and a springboard to future success. Visit our careers page to get a closer look at who we are as well as our current openings. ← Do You Have the Right Marketing Team for Long-Term Success?